When you need to replace missing teeth, dental implants are an excellent option to consider. Today’s implant designs allow you to replace a single tooth as well as cases involving multiple teeth or all of your teeth. A single implant with a crown that fills in open spaces where a tooth has been extracted, instead of having to anchor a traditional bridge on the adjacent teeth. Two implants with a bridge to fill in larger gaps where multiple missing teeth are a concern. Multiple implants with a long bridge that spans the entire arch. Fewer implants with a supported denture that’s more comfortable to wear and less bulky than a conventional prosthesis. Implants are only recommended in instances where there are good bone quality and a healthy oral environment to support them. For some people to be eligible for treatment, a bone graft may be needed to ensure there is adequate support. After having a CT scan taken, we can proceed with the specific recommendations surrounding the placement method and the number of implants required to make your case a success. Getting dental implants is a process that spans several weeks or a few months, due to the time necessary as your body responds and heals between treatments. For instance, we will want to ensure that the implant integrates with your bone and that the soft tissues are shaped appropriately before a permanent crown, bridge or denture is affixed to them. We can provide you with an estimated timeline during your initial evaluation. Today, implants are the preferred treatment of choice for our patients with missing teeth. Because the integrity and longevity of an implant design allow it to mimic natural teeth more closely than any other type of dental restoration, it’s hugely beneficial in many ways. Implants are structurally sound and capable of withstanding an extreme amount of force. As such, we’re able to use them in pairs to support multi-tooth restorations like bridges. Plus, their support of bone and gum structures over them minimises the “sunken in” or shallow facial appearances often seen with tooth loss. Being that implants add depth and volume to your bite, they help to fill out your cheeks and lips. Choosing to invest in dental implants is a decision that will affect your smile for the rest of your life. Only you can decide if the investment is worth it or not. Here at 7 Pearls Dental, we only use reputable implants, genuine components and Australian Laboratories for all restorations. As each and every patient has unique needs, a final quote can only be obtained after a full consultation and assessment of suitability. Where there is a single tooth missing, we would use a single dental implant to replace the missing tooth. For this procedure, the titanium dental implant undergoes the process of osseointegration whereby over a period of a few months, the implant will effectively fuse with your jawbone as it heals. This forms a strong and durable tooth root alternative which stimulates the jawbone and gum line to keep them alive and healthy. On top of the dental implant, an abutment is place which is then covered with a strong prosthetic tooth, such as a dental crown. At this appointment, we will review your treatment goals and discuss the process involved in dental implant treatment, providing both the costs and the time estimates. If you have any previous X-rays or 3D-scans they would be helpful at this visit, otherwise they will be required at your next visit. If you know what you need and want, we can skip forward and go straight to Step 2. If you are a suitable dental implant candidate, you will be scheduled for a record taking appointment which allows us to plan your treatment from start to finish. The most common records required is a Cone beam x-ray (3D Jaw scan), a scan/impression of your teeth and gums. The cost of this appointment is $231, for which the health fund rebate may apply for the following codes: 071×2, and 678. We then proceed to schedule a final consult where we will go through all of the most pertinent details and factors regarding your specific case and circumstance, and we may be able to present varying options and prices when more than one suitable option exists. By the end of the visit you will be presented a fully itemised treatment plan with all costs including time frames for the treatments proposed. When you are ready to proceed we will take a $500 deposit and order the necessary surgical equipment for your case. This appointment is unique to each case and can range from 60-120min depending on the complexity of your case. Your Final restoration is usually delivered around 3-4 months after your initial surgery. If you require a temporary restoration until this time, many options exist and will discussed with you in your planning appointment. A well placed and restored dental implant should provide years, and ideally decades of function. However, it is important to maintain excellent Oral Hygiene and have regular dental checkup and hygiene appointments, not just to monitor and maintain your dental implant, but your whole mouth. This way, were there to be any issues, we can pick them up early on and prevent them from becoming a more serious problem. Unfortunately, we commonly encounter implant sites which are deficient in soft tissue (gum) and, or hard tissue (bone) volume. In these cases, additional augmentation procedures are either essential for implant treatment, or beneficial for treatment. At your consultation any specific extra requirements or optional extra treatments will be discussed. In some cases grafts can be avoided but may result in a less aesthetic outcome. Find out if implants are right for you. 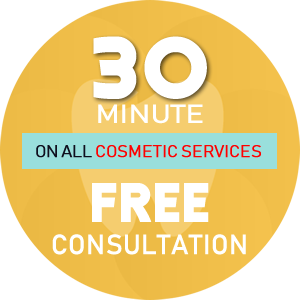 We offer a 30-minute consultation to see if you qualify for this state-of-the-art treatment. Contact us today to get started!